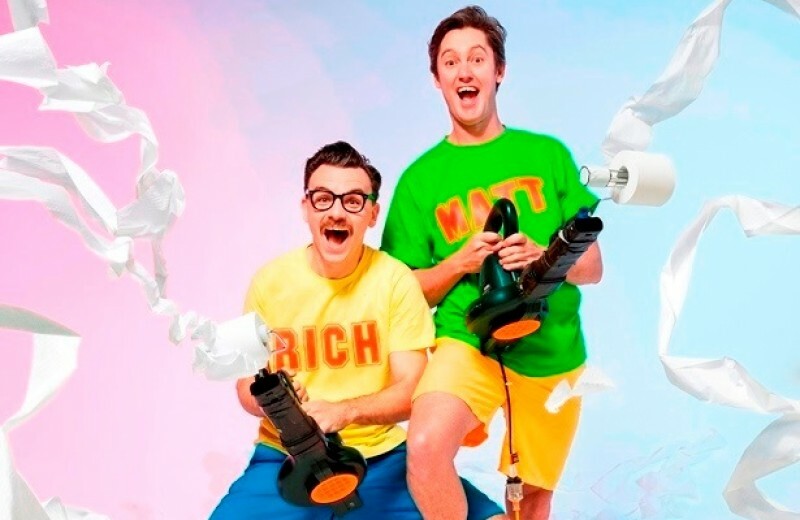 REVIEW: The Listies Will Make You LOL! It says it all in the title. Who are The Listies? Richard Higgins and Matt Kelly are a couple of young men who act like they’ve never grown up – and thank goodness! What’s a LOL? Really? If you don’t know text talk for Laugh Out Loud, I’ve no idea how you’ll cope with Matt’s Face Texting, even though the technology required for that is minimal (but, as with most technology, the kids get it faster than the parents). The Darebin Arts Centre was a large venue for such an intimate show, but they made it work through good use of microphones (albeit with slightly dodgy headsets) and racing from one end of the theatre to the other. It didn’t matter whether you were sitting front row or way up the back, you got a good chance to get a pair of dirty undies in the face. The kids in the audience were roaring with laughter throughout – I heard several children from different families around me saying to their parents “It’s sooooo funny!” But don’t think you’ll be bored, parents, guardians, aunts and uncles. There’s even a hint of political satire… well, just a hint. The Listies have just about finished up their recent tour around the country (though there is one more show coming up at the Lorne Festival on August 29), but keep your eye on their website. If you have small children in your life, treat them to some Listies fun!